Soms overvalt ons op de redactie van Afrikaanse Toestanden een speciaal gevoel. Misschien ken je het wel. Het begint in je buik, maar zit ook een beetje in je oren: Afrostalgia – het verlangen naar een Afrika dat je nooit gekend hebt. Hallelujah social media en dat retro weer zo in is. En goddank voor de globalisering. Want als je dan, vanuit dat diepe gevoel, op zoek gaat naar Afrikaanse helden die om een of andere reden nooit mainstream zijn geraakt, stuit je op onvermoede weelde. In aflevering 1 van Afrostalgia: William Onyeabor. De Nigeriaan die je nooit gekend hebt, omdat hij ook niet gekend wil zijn. If characters of the calibre of Four Tet, Damon Albarn, Hot Chip, Devandra Banhart and, er, Alan Carr are endorsing an album and Pitchfork give it an 8.6, you know something special is brewing. William Onyeabor’s credentials are impeccable: the retrospective of his career is released on David Byrne’s Luaka Bop label and on the first of April he’s got an evening dedicated to him at London’s Barbican. Except he won’t be there. Nor will he be giving any performances in the future, because that’s perhaps the greatest reason for the hype – nobody really knows anything about him. Is he a filmmaker, a Russian spy, a priest? Well, he might have been all three. It took Luaka Bop five years to track him down, only to be instantly rebuffed. The great man’s answer to an enquiry about his music was “Why would I want to talk about that. 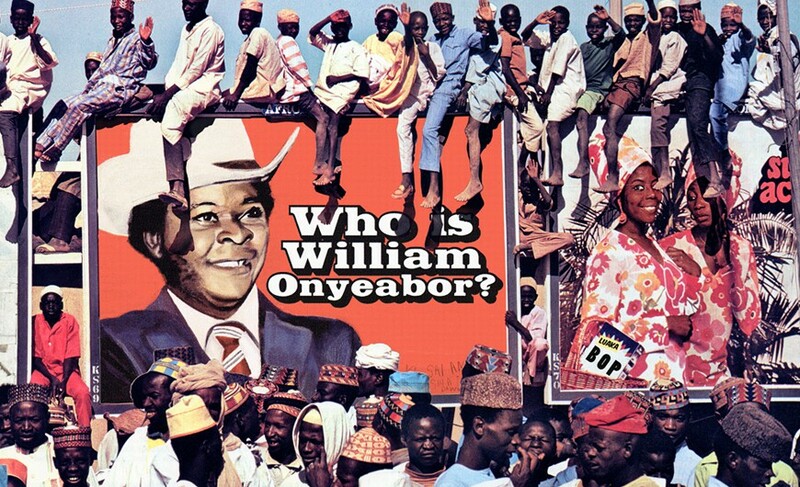 I just want to talk about Jesus.” Hence the album title Who Is William Onyeabor? In the post Searching for Sugarman era, the quest has of course been recorded in a short documentary (which thankfully largely resists the slightly saccharine overtones of its Hollywood equivalent) that you can watch here. Quite apart from the man himself, what’s remarkable about the film is how everyone, especially on the UK/US side, is keen to point out how ahead of his time Onyeabor was in a country like Nigeria – while the Nigerian perspective is simply that he was a slightly strange man who made hits that were in constant rotation on the radio and in clubs. The only thing both sides can really agree on is that Onyeabor was as reticent then as now. Not that this really matters to anyone apart from Luaka Bop– a reclusive genius unappreciated in his own time simply makes for a much better story. Ultimately no posturing or record label spin really matters (although I would love to know just how Mr Onyeabor managed to assemble such a large collection of synths in Nigeria in the 70s). This is just fantastic music. My girlfriend is fond of showing anyone who will watch a film she took of me listening to Fantastic Man. I’m sitting behind a desk on my exercise ball and when the melody kicks in, my buttocks begin to bounce and swing to the music (it’s at moments like this that the ball comes in really handy). It’s simply irresistible – the music, I hasten to add, not my behind. People like Albarn and Caribou might like to pick apart which kind of synth was used and how, but when you’ve got hooks like this, you don’t really care about technical details, you just want to shake your rump. That’s the thing about Onyeabor’s music – it shouldn’t be confined to cratediggers or Africaphiles – this is music for everyone to enjoy. Which is ultimately what music is for, not writing grandiose statements about. ← Arm maar Happy? Afrikaanse videos voor Pharells vrolijke hit.